The EDD050000 is designed to enable basic training on logic functions. It is equipped with 4 Zero Insertion Force (ZIF) sockets. The student plugs the components to be studied into the socket, all connections are achieved by 2-mm patch leads & banana plugs. The EDD 100 000 logic training board enables the study of basic combinatorial or sequential logic (AND, OR, NOT, XOR, RS & JK flip-flops,...). Different technologies are available from discrete components: RD (Resistors, Diodes), DTL (Diode-Transistor Logic) & TTL (Transistor-Transistor Logic) integrated circuits. Mimic layouts displayed are similar to the industrial datasheet diagrams. 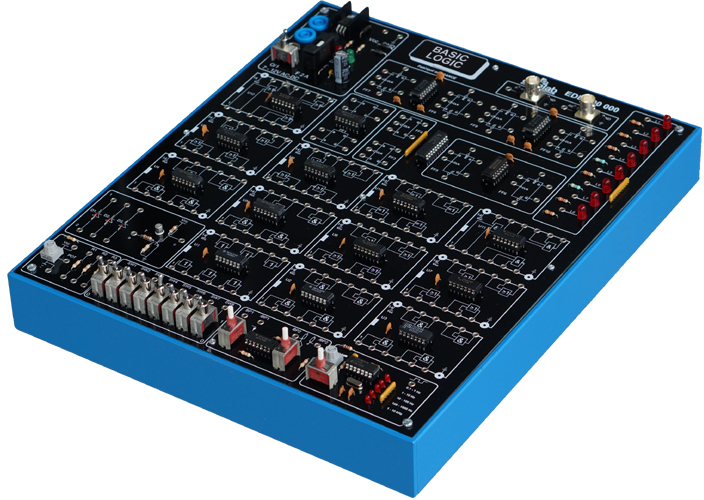 The EDD120000 digital logic simulator module is an extension module of the EDD100000 combinatory logic simulator. It enables the study of combinatory circuits (amplifiers, open collectors & 3-state logic) and digital functions (comparators, shift registers, up/down counter, ALU). Complete practical works (questions & solutions) are provided with the equipment. The EDD200000 board is delivered with accessories, enabling the study of EPLD programmable logic, as well as the operations & skills for VHDL language (developed by Lattice Semiconductor®). For an easier maintenance, all components are plugged on sockets.